NSP Update 5: Ranking in Google and Making Money! Today, I am going to share another update to my public niche site project that I started just a little while ago. So far, I have written 6 posts that explain exactly what the project is all about, what my goals are, how I found the keyword I'm targeting, and more. NSP Update 4: My Niche Site is Live!…Now What? This will give you an in-depth look at exactly what I've done up to this point for my site: best survival knifeguide . (com). (I'm purposely not linking to my site). Up to this point, all I've done is great keyword research and produced some solid content. I now have about 4 to 5 articles on the site and its already showing up in Google! In fact, with absolutely NO link building, the site has reached as high as position 25 in Google for my primary keyword (best survival knife). Its been bouncing between 25 and 30 for the past few days. This gives me encouragement that I picked a great keyword, because I'm ranking on the 3rd page of Google with no link building. Obviously once I actually go out and start building links, I expect the site to climb further in the ranks and hopefully to position 1. Believe it or not, I've actually made a few sales! Now, I'll be the first to point out that I'm clearly getting traffic to the niche site from readers of this blog. However, I can tell from my Google analytics that I am truly getting some natural search engine traffic as well. I can tell, because I'm getting hits from some longer tailed phrases that I doubt any of you are typing in to find my site. These are some great long tail phrases that “real” Google searchers are using to find my site right now. And I haven't done any off-page SEO yet to try and rank! I already knew this niche had potential from my in-depth keyword research, but the data is starting to validate that research I did. The great thing about the Amazon Associates program is that I get credit for ANY purchase someone makes from Amazon within 24 hours of going through my affiliate link. For example, you will see the other sale I made was for a pair of Levis! I did not talk about Levis or link to jeans at all on my niche site. However, someone clearly visited my site, clicked on one of my knife affiliate links, and then within 24 hours bought a pair of pants. So, I've made $9.68 in the first few days of March from my new niche site! And just to be honest and up front: Its totally possible that a reader from Niche Pursuits went to my niche site, clicked on my affiliate link and later bought the pants. I have no way of knowing if all the sales I make are “natural” visitors or my blog reader visitors. However, I can clearly see that I AM getting natural search engine traffic, and my hunch is that any knife sales are most likely to be “natural” sales. So, if I understand this “Orders Report” correct, this means someone bought a ESEE 6 Survial Knife (a $160+ purchase) that I will get credit for once it ships. So, its been ordered, but not shipped yet. From my small amount of research, I will get paid for this item once the order is fulfilled. So, sweet! Another knife sale that I should get paid for! I have a few posts up on my niche site right now, and I have about 7 or 8 more ordered through Textbroker.com. As explained in my previous post about a content strategy, I've found several secondary keywords using Long Tail Pro that I'm now outsourcing articles for. In addition, I was contacted by a Niche Pursuits blog reader who also happens to own a couple of sites in the military/guns/knives niche who offered to write for my site. He's an expert that has done MANY product reviews in the past, so I'm paying him to do a few product reviews for me. He's more expensive than Textbroker, but the quality is outstanding so far. Overall, I'm happy with the way the content is turning out, and I expect to post about 1 article a day for the next 2 weeks or so. Then I'll re-evaluate where everything is to see if I need more content or if I should focus on link building. As mentioned, I have not built any links to the site yet. However, that is going to change this week. This is not meant to be an in-depth explanation of my link building plan, but I wanted to let you know what I'm getting started with. I expect to write a more in-depth link building plan later this week. For now, I am going to do some basic web directory links and blog comments. The web directories are “white hat” links that Google approves of…as long as you don't overdo it. I'll submit my site to 50 or 60 web directories, and expect that less than half of these will turn into “live” links. (Many web directories never approve your site or don't go live for other reasons). I'll be paying my VA to do the directory submissions. In addition, I'll be making some blog comments from relevant blogs. I will personally be doing this one. I'm not looking for high PR pages really at this point, I'm just looking for relevant blogs that I can make real comments on. The comments will not be spammy in any way. I'll actually read the articles and post a relevant comment. So, right now I'm just trying to get a small base of links that let Google know I'm around and can provide a little bit of value. I won't be using my keyword in my links much because I want everything as natural as possible right now. Anyway, I'll be sharing much more in the next few days in regards to link building. Overall, I'm excited to report that I'm getting some traffic in Google, I'm ranking, and I've made a few sales! I have a long way to go, but these early signs are promising. As I add more great content and start ranking better in Google, I really expect more and more sales to start rolling in. As always, I would love to hear your thoughts, comments, or questions. Was there anything I didn't cover that you want to know about? Let me know! Finally, I tend to share a few more updates via Facebook, so if you haven't “liked” my Facebook page yet, please follow along here! It’s amazing that you have already seen a sale or two! Your posts have helped to motivate me to build a niche site that actually provides useful information instead of micro niche sites that are just made for adsense. A problem I’ve been having my mns is that their niche is so small that its hard to get relevant backlinks from comments, so I guess it really is time to work on a niche/authority site! Providing useful information in a well-organized manner is the ONLY way to survive moving forward… and with Google being so “algorithmically-challenged” lately, there are still no guarantees. Spencer has picked a great niche because survivalist / prepper stuff is very hot right now, and the market is still relatively under-served. I think this early success of Spencer’s niche site largely depends on his keyword research. I’m not a firm believer on LTP’s Keyword Competitiveness Checker but I think it’d be great to give it a try 😀 I will probably upgrade to Platinum right now lol.. BUT you believe LTP competitiveness now, don’t you? Ha ha… Congrats man. Wow, Spencer, this is so inspiring and the fact that you are already making sales is amazing. I think I need your link building strategy implemented a bit better if I’m going to do as well as you! Wish me luck, thanks for all the inspiration, this series has really kick started my plans for the year. The long tail traffic is where it’s at right now. I do not see that changing anytime soon. I don’t know about you, but Pat Flynn’s year-end review was a BIG eye-opener for me. When looking at the numbers for his Security Guard website (a site that earned $25,218 in 2012), he noted: “In 2012, security guard training accounted for 10.28% of my total traffic.” The rest of the traffic was from 59,861 other long tail keywords. I agree, its about the long tail. But the best way to get this long tail traffic is to rank for a decent sized keyword (like best survival knife), then you get all the related phrases that go along with that. And as you produce more content, the long tail will hopefully keep rolling in. Yeah, it is a process. Excellent! It’s actually an awesome idea to use Amazon content to monetize the site since many site owners want to grow the site in size and traffic before actually “monetizing” the site with any online ads or product. I have some sites, 1-3 years old, that are really hands off, after the initial build, that promote ebay. They are product specific sites and do pretty well on long tails. Though when I mixed ebay and amazon on one site they usually did worse than having only one: ebay or amazon. Interesting. I may be testing out combining multiple monetization methods down the road. Over about 120 sites, the ones that got hit the worst had both monetization methods and the survivors only one. Mind you, most of them were not of the quality of site you’re working on for this project. Congratulations Spencer and thanks for posting this – it’s really motivating to see someone start from scratch and end up with real dollars so soon already! It helped me to regain my motivation in building more unique Micro Niche websites and working on them. However i would like to know what are the additional tools you use apart from Long Tail Pro? I’ve discussed all the tools used so far (I think). Long Tail Pro, WordPress, several plugins mentioned, Niche Website theme, and that’s about it so far. But i would like to more about your Web 2.0 tools, something like Magic Submitter or so. You attract traffic my friend, even you’re on 3rd page! Awesome Spencer! I’m happy to see this. As for me, I wanted to tell you, that I have followed your strategy exactly I used long tail pro and just bought niche website theme. Last week, I wrote my primary article and after 6 days, I am # 5 in Google. That has stayed steady at 5,6 and 7 and back to 5 since Friday! I will monetize the site this week and see what happens. Thank you for doing this Spencer! Congrats on your first sale! Do you submit your site URL to the web directories, or just a single article? If it’s just an article, do you submit the one to all 50-60 directories? Is there a list out there somewhere of the more popular directories? Just the site URL. There are lists out there that you can find with a quick google search. I’ll perhaps provide a list in my next post. Thanks .. I think I was confusing web directories with stuff like Ezine articles. Awesome stuff! I’m monitoring this survival knife site carefully because I want to do something similar (I mean a product review site, not a knife site!). When you post the 15-20 comments you mentioned will you post them from your own computer using your own name or do something more complicated than that? I’m concerned that google may not like the self-promotion. Thanks! Yes, I’ll use my own computer. And yes, I’ll use my name. Perhaps something like, Spencer @ Survival Knife Guide, or just Spencer, or something like that (will vary it slightly). Glad you making some money already! Question, I see that you use TextBroker for your content but have you had any experience in hiring a full time VA for writing your articles? Wouldn’t that be a better option? I’ve hired people off and on for many projects. I just haven’t found someone I’m 100% happy with yet. I like textbroker for the quick turnaround time and ease of use. Textbroker does seem like it is the place to get articles written. How do you set up your guidelines for the article in Textbroker? I know that Adsense Flippers have a particular guideline I was wondering if you had the same thing. Also, I really like that table it is very slick. I may have to give it a try on my website as well. Another question, do you bulk add content or do a slow release? Loving the successful you are seeing. Slow release content. I do have guidelines for articles, I did a post on it a while ago, if you search my blog here you should find it (maybe a year old). Thanks for the information Spencer. I have have a look for the post. I am amazed at how seemingly effortlessly you are able to make your first dollar on a site. I realize you have years of experience behind you, but DAMN! Yet it’s incredibly inspiring and encouraging. Thanks Joe. Don’t forget about the MANY hours of research, chart creating, and writing time I put in before anything happened. I still have alot of work ahead of me. I’m doing a lot of work behind the scenes that you read about here, but has taken a few weeks to accomplish overall. But yes, I also have alot of experience to help me avoid common mistakes. Having done similar projects (niche site + Amazon) in the past, I can attest to the fact that creating a site like this is far from effortless. now return the favour 🙂 and tell me if you would consider a 7000 LS and $0.70 with 0 competition according to ltp a golden nugget ? Congratulation Spencer on your sales. What plugins are you using to pull the amazon info? I’m using the easy azon plugin here for my Amazon affiliate links: https://www.nichepursuits.com/easyazon. Its makes inserting amazon links much easier…really enjoying it so far. How does Azon compare to Wp Zon Builder? Its’ considered one if not the best Wp Amazon plugins out there. Just wondering your thoughts on this. I haven’t used WP zon builder, so can’t compare. I’m really happy with EasyAzon though. What a great post and project write. I am just staring out in this field and trying to learn I found your site and it really opened my eyes to the right way to do this. My finding is yahoo / bing likes my site better and is sending me much more traffic. Is this common? Thanks again for teaching me so long and can’t wait for more posts! Yahoo and Bing should only be sending you more traffic if your site isn’t ranking in Google yet…or if Google penalized it :(. When I google your keyword your site comes up #3 and your about page is #5. I ‘m not logged in and my cache is cleared so maybe some of your traffic is coming people seeing your site on page 1. The first Amazon sale is always exciting! My first niche site…which is approaching its first birthday has been primarily monetized by the Amazon Affiliate Program. Amazon has consistently accounted for 2/3 of my monthly revenue from the site…Adsense only constitutes 1/3. I think it’s one of the most underrated monetization strategies out there, so I think you’re going to see some damn good results. Also, how awesome is it that you got credit for those Levi’s? Last month, someone bought a $500+ HD tv…and this isn’t even my niche! Spencer, congrats on getting the first sales! That TablePress plugin is quite neat for preparing the comparison charts. Congratulations Spencer on your first dollar from this site – and so quick too. Despite the fact that you are already successful I suggest you must have had a buzz when that Amazon payment came through :-). The way you are putting your site together is exactly the same way I was taught to build my first authority site. Anyway, the sooner you put a programme together that follow these methods, and which will encourage newbies to earn a CONTINUING income by BUILDING A BUSINESS instead of buying get rich quick WSOs the better. Or maybe they don’t want to hear that message. I was actually on your side of the pond last week getting married and so didn´t spend any time working on my niche site or checking in on your progress. It has been great to get back and see that you are off to a flying start! My new site is sitting around 9th on googles first page but the traffic is only averaging around 5 unique visitors a day. I have noticed though on the two days after making a blog post on a connected site that linked to mine, I received an average of 15 new visitors. This has made me think that I will need to consistently add blog posts and comments with relevent information to keep attracting new visitors. I have selected two forums that I will dedicate time to and become a “regular” for the sake of this project. I have submitted my application to Adsense today and have primarily placed where the ads will go once I get approved. I have followed the advice of following where the eyes will naturally travel, keeping it above the fold and blending into the rest of the site! I am hopeful that the next 4 weeks will see an increase in traffic as I start building links, adding content and becoming more active in forums. I have also written a 20 page Ebook that offers specific advice regarding my niche that I think will be very useful to people who arrive by using my targeted keyword. My plan is to offer this Ebook for free to start building a mailing list. My Question is – Do you think it is a good idea to start building a collection of email addresses even though I currently have not decided how I will use them? I currently have no strategy but thought it would be good to build a list for the future? Sounds great Carl! Congrats on getting married!!! Yes, I think collecting email addresses is a good idea. I don’t do this on most of my niche sites, but I probably should. I most likely will for this niche site. Step 2 is changing that awful theme, geez. Awesome analysis and great to see you’re generating revenue from the site. More power to you and keep us posted with the progress. As usual, you got me thinking again about building some more niche sites. I love this process and really appreciate the transparency. It’s helping me to reinforce that I have the right actions that I’m taking and that it’s likely the key words I’ve chosen that were the issue. Not the rest of the process. Hey Spencer I have been following you for a long time and this is one of the best things you have ever shared with us. It’s great to see a case study from start to finish. I had some successful niche blogs but once penguin hit they sank like a rock. I almost gave up but have started over and am doing things different and better this time. Awesome work Spencer, I’ve been following you very closely. One thing I’m unsure of, down the track when you’re building links do you use your longtail keywords as anchor text and do you link those to the home page or sub pages? Sometimes you’ll use long tail keywords as anchor text, other times not. Sometimes homepage and sometimes subpages. (More details in future posts). Thanks for this series. It has really been an inspiration to dust off the ambition of building niche sites myself and really push for the success that is clearly there. You do really need to do good research upfront to pick a niche and then a solid keyword. I’ve used a lot of keyword tools in the past and really enjoy the simplicity of Long Tail Pro. I am looking forward to your linking strategy, I think for a long time I have forgotten about backlinks and their importance and solely concentrated on content. Hey Spencer, I found your site after you received a mention from the guys at Adsense Flippers. I’ve subscribed to your podcast and look forward to hearing more about your backlink strategy as you move forward with this project. Great update on your site, look alike it is shaping up nicely. Just to confirm, the orders not yet shipped will result in a commission, so you should see that in the next day or two, or more if shipping time is longer. Quick question for you, Spencer. How did you get the logo at the top to align with the menu bar? I use niche site theme as well, but haven’t figured that out. The logo is actually the same image as the banner, so it was designed that way. I’m actually not real happy with the design right now (I let my graphics guy take a stab at it). I’m likely going to change it up…not a big fan of the green. You let your graphics guy take a “stab” at it…was that pun intended? Heh. Hi Spencer. Where have the reviews on the site come from? Are they real reviews they seem similar to the amazon reviews but differently phrased. I mentioned in the post where I got my article writers. Thanks for the update, keeps good as always! I’m really impress how fast you could rank and make your first sell. It was a really great KW research, definilly you got a good one. Dude…this is awesome. Can’t believe you already made a couple of sales. I can’t wait to see where this goes. Great update Spencer – keep it going! Do you think you’ll be able to get past QDF (query deserves freshness) or do you expect a drop before rising back up again? Sure, there may be some bouncing around…I expect that. Blogging is all about sharing real time experiences not selling crap all day non stop. It’s so much easier to sell your product once you know why your customers will buy it. I searched Google for Luis Vuitton giraffe neck sweaters lol, damn algo changes. Nice to see you’re still moving along Spencer, and have a few sales! I’m following along with you, and so far I’ve written 10 articles for my website. I purchased the niche website theme and had a professional logo made. I plan on writing at least 100 articles, possibly more. I have not started any link building just yet, because I want to give the site some time to age and index the articles, but I check some of my long tail keywords and they are ranking up on the 2nd page for there search term. Looking forward the the rest of this journey! Spencer, Thank you for rolling out this case study live. I have been watching the site every few days. I have decided to create a site completely based on your methods (not the same keywords of course). I started the site and I purchased the niche themes, which is ok. Having issues with google Analytics recognizing the code, but I will figure that out. Anyway, I was hoping in your next post about the site you could go into more detail about the link building, describing specifics like article directories, Web 2.0, guesting, etc. Also, wondering if you can go into some details about writing articles using other “related” longtail keywords? Thanks again for sharing this build with us. Apart from the motivational factor, the actual process is teaching me a lot of things I just did not know, Thanks. That just goes to what great keyword research, great content, and having a plan will do for you. I’m not sure if this has been pointed out but your site ranks #3 on google when I do a search for your main keyword. You’re Amazon progress sounds similar to mine. This year I’m actually adding an ebook to my site. My goals the end of the month. Have you ever considered writing an ebook? I’m still kinda new to this site, but I think Spencer actually has a free ebook available on here. Yes. I very likely will do an ebook for optins to start. Thats Great Spencer. Keep up The Good Work. Keep me updated on your progress, i love to see it. This update is awesome Spencer! I’m in the process of adding content to the site. Usually I outsourced content via Odesk but this time (I have one public case study on my blog, inspired by you) I decided to use TextBroker and some other services on WarriorForum. Thank you for your articles and great inspiration! I’m a long time reader of your blog and have been following this case study since you began. It was always so inspiring to read about how you build your business and the success you have. Kudos to you. As I said, I’ve been reading your blog for sometime but never commented but felt obligated today. I was the one who purchased those LEVIS so I felt like that screenshot was a personal shoutout to me and I owed it to Mohit, an earlier commenter, to reveal myself. 🙂 I always thought it was cool how Amazon gives you credit for any purchases someone makes through your site and its cool that I was able to help you out a little bit with that pair of jeans I desperately needed. Lol. Anyway, I’m following this case study and implementing a lot of your strategies into my new site that I just started so I hope I can have the same success you’re having. Thanks again for this case study! My suspicions were confirmed! Hope the pants fit well…lol…thanks Kelvin! I was not an Amazon fan really due to the notion that 24 hours is not enough to sell a particular product from my niche site. However, your example has confirmed that Amazon does play it fair by rewarding the blogger who helped generate ANY sales. Long tail is very powerful indeed. I definitely did my keyword research wrong! 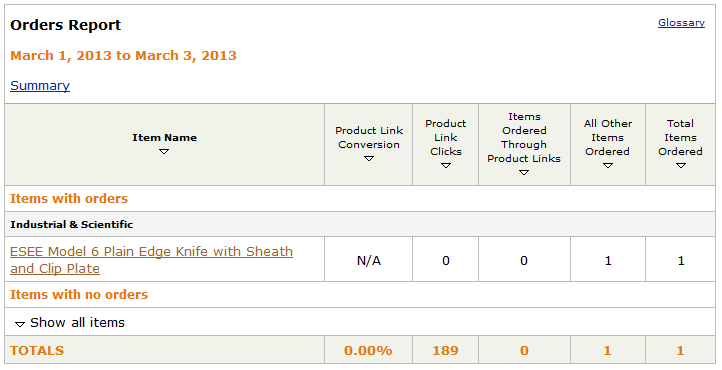 With the orders report on amazon, you can click on the arrow next to ‘show all items’ and then see what links people have clicked on. This is helpful as if you notice 20 people have clicked on a link, but not bought the product, it might be because the product is out of stock, or has bad reviews so maybe change the link to a different retailer (via Commission Junction) or link to a different page on amazon. Loving this series and watching what’s happening with the site. When you say “I’ve still got a lot of work ahead of me” what are you expecting for or hoping to see as an end result? Do you just keep growing and building the site until the returns are diminishing compared to the work or do you have a figure in mind to be generating… a target? The end goal is $500/mth in revenue. A lot of the work now will be link building. I’ll still be adding content, but its mostly outsourced now…so my work is minimal there. Absolutely wonderful & Congrats. I am a bit surprised that you are going to submit to web directories… I got a couple of sites penalized due to web directories (as they have been de-indexed now) & also note that I didn’t do any other black hat methods (paid links, blasts etc). My link profile is pretty diverse but it is my guess that directories tanked my sites. Don’t you think that the web directories that you are submitting now might get slapped in the next update. They might cause you to lose rankings (not now but later). It would be great if you can also post the list of directories. If you submit to well established web directories, then no. Also, I’m not submitting to even hundreds and certainly not thousands of directories. It will just be a few dozen higher end directories. I’ve decided to do a public niche site project for my readers (and for myself, duh). – Add some stakes. Everybody puts $10 in a pot and each person who misses a deadline forfeits their $10. At the end, everybody who saw their niche site through to completion (whether or not it made any money) will be entered into a random raffle and one person will win the pot. What do you think guys? Spencer? If we can get at least 10 people on board, I think we can make a little “dent in the universe” as Steve Jobs was fond of saying. To clarify, missing a deadline would take you out of the raffle even if you wound up completing your niche site. I think its a great idea. However, I’m not ready to do anything like that right now. Everyone can feel free to leave a comment on my posts with updates on how their sites are doing (as many do). For now I’m not sure I’m not willing or have time to take on another task of administering a contest, etc. Great stuff, Spencer. You’re really providing a useful service here. Regarding the perpetual “how many articles” question. It is NOT the number of posts which will make or break the site. It is the question of “does each article actually provide some information that the reader would not just get by reading the descriptions in Amazon”. Example I got juts from reading this post. I know nothing about knives. I was quite surprised to see so many expensive folding knives. I always thought heavy-duty survival knives would be long, heavy solid sheath type knives. Obviously, that’s not the case. So an informed article that told me the plus and minus factors of solid versus folding would be useful. Just some little filler article like “The XYZ knife is long and sharp and shiny, please buy it” would be worth nothing. Also as one who lives in the Philippines, I know first hand what goes on all too often with many of these ‘full time virtual assistant’ deals. It takes supervisory and organizational skills and real effort to keep a full-time assistant occupied (and learning). Unless you really have 40 hours a week worth of work and are willing (and able) to take the time it takes to keep a full-time employee actively engaged, it is typically MUCH more cost effective to order articles “by the piece” from a service which specialties in just that. I’ve been contacted more than once by Filipino “virtual assistants” who are bored and discouraged because they were hired by folks back in the USA to work, but get no guidance, coaching and contact … they are just sort of “lost in space” for days or weeks at a time … and eventually both the employee and employer end their relationship with a sad, sour taste in their mouths. You can’t hire a VA to do what you don’t already know how to do yourself … just doesn’t work that way. I guess I wasn’t being as clear as I should have been … I was trying to use the folding versus fixed idea as something that came to my mind in order to illustrate _your_ method of answering actual questions about products in your articles a opposed to the ‘how many articles do you think is enough” ideas expressed by some, where an “article” is just a few hundred words jumbled together about a product that really provides no information at all. Sorry for my lack of clarity there, Spencer. Something tells me you may get hooked on this Amazon monetization method. There’s just something about knowing that you helped convince somebody to buy an actual product – rather than just a click on an Adsense link that may or may not have converted for the advertiser. After you have great success with this site, I’m sure you’ll be searching for the next great product/keyword that you can promote and build another Amazon site around. As for my Mini NSP – I haven’t had time to even think about my content yet. I’m already ranking at #457 in Google (#59 in Bing) with my only post being the WordPress default “Hello World” post! Haha. Great job, getting some sales so soon. Also, do you think you would include Adsense at some stage as a booster to the monetisation ? Awesome. Which is the long article on the site that you talked about writing? The Bear Grylls review looks like the longest article, but several seem about the same length. The homepage is the long article; almost 2000 words long. Nice! I definitely love the fact that Amazon credits you for the 24-hour upsells too. One of my high-traffic posts leads to some low-cost items on Amazon that I get a lot of sales on. The profit for each is small, but it boosts my numbers, which increases my commission rate, and then the occasional upsells tend to boost the overall numbers! Congrats on your first dollar though your open niche site project. I must say you were bang on while doing keyword research and content creation. Loved your home page stuff. I am doing keyword research and competition research for my new niche site. Wanted to know, whether I can go ahead and select a primary keyword (6600 Local Exact monthly searches, CPC over $1.3) that has competition from high authority sites like Huffington post, pintrest (490 pins), one photo site, squidoo lense and youtube, though they are not actually targeting the keyword phrase. Some of them not even targeting phrase match, leave alone exact match in title or contents. Not many backlinks to the page. Obviously, domains have millions of backlinks. Strong competition in terms of authority sites but not targeting I think. I have no problem revealing my keyword to you. But I am concerned about other watchdogs. To be honest, my main concern is not backlinks, but google’s love for authority sites, their own services (youtube, blogger etc) and social medias. In my recent research, I see lots of such results without relevance, backlinks and quality information (yes, because some crappy sites and affiliate web 2.0 properties are ranking for relatively high competition keywords). Most of the pages (6-7) has 0 backlinks. This has been a very encouraging follow-along series Spencer. Thanks! There is a lot of good info in here for those of us trying to create niche sites of our own. You’re finally just starting to get to the part where I feel I need the most help: back linking. I understand why you would be using directories to get links. These are generally easy to get and usually one-way dofollow. I do have a question regarding the blog comments. I know most of them are nofollow. Will you be actively seeking out only sites that have dofollow comments? Or does this not really matter and you’ll be looking to take the link either way? If so, what is the relevance of building nofollow links? No, I will not be looking for nofollow blog comments. I want some Nofollow in there…I want a natural link building profile…and this should include nofollow links from relevant sites. Could you a take a sec to tell us how much time and money you have invested in this niche site so far? I love what you are doing. Thanks for giving back to your readers! I mentioned this in the previous post. But maybe 5 hours keyword research, 10 hours on chart and content creation. Then another hour or 2 doing other tasks. I haven’t been keeping track, but maybe close to 20 hours total? Hey again – just wanted to say how helpful all these comments are – not just from Spencer but from all involved. I am also happy to say that I have now been approved for Adsense! Also, from reading the comments about Amazon, I have decided to add a few small image links to products that are relevant to my posts. Whilst I will keep my main focus on optimising the website with adsense, I think having a few images that could potentially monetise wont hurt. @Vic Dorfman – I like your idea for a competition. I think it would make it interesting to see the progress of other people who you can draw open comparsions with! Great update. Looking forward to the link building portion of this series, and how you decide on the 50 directories. Excellent work! am asking are you hosting this domain name and hosting on different registrar different from the ones your sites are hosted on? for SEO reason? If yes, which hosting company and domain registrar do you use on this site? Please don’t take this the wrong way but I must say the WordPress theme looks nothing special at all. For $77 (seems to be the going rate) what am I getting over many of the free WordPress themes? Watch the demo video on the sales page. Tons of options that free wordpress themes don’t offer: Design layout, design, and completely customize with just a few clicks. Auto-rotate ads, match colors of adsense ads to theme automatically, and much more. Not really the purpose here to discuss the theme, but hopefully some of that helps. What I don’t understand though, is why monetize with Amazon? It’s such a LOW paying program and you would surely make more money monetizing with almost anything else. Amazon starts at 4% , easy to get to %6.5 (and not too difficult to get to 8% with ‘filler’ low priced products). As spencer has said Amazon is brilliant at selling products, even unrelated ones. I have sites which have both (amazon and non-amazon) affiliate links and amazon will always over sell even on a similar CTR. Especially high priced items which are $300 + its a trust thing..
Paul – as you may know, I own hundreds of websites and none of theme are monetized with Amazon (other than this one). Google Adsense is my personal favorite. However, I purposely said from the beginning I would monetize with something besides Adsense; and Amazon was a perfect fit. I’m also FAR from finished monetizing. I have plans for building an email list, and monetize with affiliate products and much more. Great work! I like the way you lay out your plan of attack, very organized. I’m looking forward to the link building, hopefully you’ll describe it in detail as you have the each step so far. It is very helpful for all of us. I do have a question that has been bugging me. I can’t seem to get those long tail organic searches to come. And I’ve hear other people mention like you have now that after a couple of weeks or so you see all these semi-related long tails popping up. Do you have tips, guidelines that can help increase the chances of this? Its all about the niche/keyword you’ve chosen. Because I picked a keyword that I knew had good traffic along with lots of related keywords, I also know that I would be getting searches from these other long tail keywords as well. Thanks for the reply. Does this mean it has nothing to do with how the content is written and more of how many variations/related keywords that are available and things will just take care of themselves? Well done on getting the site ranked and earning for you, it would be quite interesting to find out what kind of conversion rate you’re experiencing from the click throughs to Amazon? I’ve set up a few niche sites in the last couple of weeks after discovering your great Niche Pursuits site and will be letting these tick-over to see what kind of results they achieve before hopefully developing more sites. I’ve tried a mix of Adsense, Affiliate products and Amazon links (I hope you don’t mind I borrowed your Tablepress idea to present the best products!). The only thing I’ve been wondering about is that the Amazon.com affiliate program is only applicable for US sales, over here in the UK there’s Amazon.co.uk. I know you’ve been targeting exact match local searches, but if you’re not specifically targettng any geographic area then I’m inclined to think I would be wasting any Amazon click throughs as visitors wouldn’t actually be able to purchase. I haven’t done it yet but some sort of country-detection script with PHP might be the best bet, and have it switching the .com / .co.uk affiliate link depending on the visitors country. Have you had any experience of this kind of geo-targeting before? Anyway thanks again for all of the podcasts and articles on the site, I think I’ve listened to pretty much all of the podcasts over the course of the last two weeks after coming across from one of your mentions by Pat Flynn. Thanks Chris! I’m actually using the EasyAzon plugin to insert my amazon links; you can check it out here: https://www.nichepursuits.com/easyazon. This plugin has the function built in you are talking about – redirects users to the appropriate Amazon (.co.uk, etc) based on their location. Allows you to have your affiliate link attached for these. You have to set up a few things, but that’s one of easy azon’s functions. Sorry I forgot to mention that after doing my keyword research using the LTP trial (will be purchasing soon I’m sure! ), I bought two domain names which only after building content for the niche sites I discovered they had been registered previously and had a range of backlinks already created. Fingers crossed that helps speed up the ranking process, and any spammy links don’t count against me! It also made me wonder why someone had given up a niche site in the past, so I checked the ‘Way Back Machine’ and saw the content on the site. It’s hard to tell why they gave it up, hopefully it was profitable, or that they just hadn’t monetised it effectively. Were the knife reviews from Amazon? Is it okay to use reviews from other websites? PS-Long Tail Pro Platinum rocks!! No. It is not okay to copy and paste someone elses reviews to your own website. This is why Google has come out with the Panda and Penguin updates. Have you been living under a rock or something? No, the reviews were not from amazon. Is it not okay to use copied content on your sites. Oops, sorry guys, I guess in a sense I have been living under a rock. I’m a noob. Thanks for the clearing that up. Haha Maggie don’t be so hard on yourself. I was just kidding with ya. But on a serious note, if you do decide to start a niche site, create original content only. Thanks, Travis. So what happened was, I was checking out the wrong site-I googled best survival knife, rather than best survival knife GUIDE. The site that didn’t belong to Spencer had user reviews on it, and I wondered how the heck he got those reviews so fast. I didn’t realize it wasn’t his site in the first place! Doh! Spencer, what happened to your custom header on your knife niche site? I liked the green with the custom header a lot, it was the best of all, don’t know why he changed it. Hi Spencer, thanks for doing this mutli-article guide. Your website has got me motivated to start building niche websites (thanks!!!) as it seems like the perfect side business. My question is in regards to economics and costs. In this article you mention multiple costs – things like paying for content to be written, paying a VA to build back links. I’ve researched these costs quite a bit and it seems like they can add up quickly! For someone starting out who doesn’t want to spend a lot of money since my batting average isn’t proven, what do you recommend? Can buying a domain and writing 15-20 articles yourself generate ad revenue as long as you do good keyword research? Basically I’m having a difficult time picturing how all these costs are economical when some successful websites make just $1 a day? Anyway, sorry about the long question and I look forward to your response. Sorry to interrupt, couldn’t hold myself. I am also newbie like you and exactly relate myself to your questions. I have done quite a lot in recent month to set a pattern for people like us. If you are ready to do excellent keyword research and have very low competition in top 10 results then it may be possible to churn 20-30 bucks a month. But to give a boost to your website, you need backlinking also. I would recommend you do build some blog commenting and web directory links to start with and then doing web 2.0. Create few account at sites like blogger, wordpress.com, weebly.com and many more. And post there with smartly placing your links. You can also do article directory submissions like ezinearticles.com, goarticles.com and many more with you links. If you have done excellent research then this would be enough I think to earn higher. This would take me a month if I give 2 hours a day for this work. Then I will work only an hour and will find more ways to backlinks and also will add content if I see traffic increase or rank improvement. However, keys here are to do exceptional keyword+niche+market research and provide readers with a value. Users engagement is a big plus after google animals (read updates). Rachel, thanks for the helpful response! Quick question, if I post a back link on an article directory or a web 2.0 wordpress blog, does google count it as a back link just because I posted it, or does it not count as a back link until someone clicks on it? To be honest, nobody exactly knows how google indexes the links, and i doubt even they know. To be on safer side, it’s always good to ping your backlinks by means of social bookmarking (don’t need to be excellent I think), cheap gig from Fiverr (let’s say 100-500 backlinks for $5, but never use such service for money site), if you have group of friends then you can ask for favor. Be careful about web 2.0 and article directories though. Hubpages, Squidoo, ezine and goarticles are rejecting like crazy after panda and penguin. So make sure you provide exactly what they want – Relevance and quality stuff. These are golden links alongside guest posting/expired domain links. I was really impressed to see that your niche website is already making affiliate sales. This is proof that quality content with long tail targeted keyphrases really drive in traffic and conversions. I’m looking forward for more updates on this endeavor and hope that I could learn a lot from it. Thanks for sharing Spencer!! Great to see, your site does well so far. I`m really interested to see the future developments here. There is definitely something going on in SERPs. Might be link-related but I think it goes deeper than that. I’m very interested to see how Spencer will go further with this. I don’t have niche sites or anything. I always contemplated the idea of doing this, but life didn’t help me going in that direction. However, I have a 3 post beauty related blog that I made to toy around with. One of the articles, posted in middle 2011, kept #1 in Google search (both web and images), for a 300/mo exact search kw, until March 6th this year. Last article on the blog, published in January this year, kept a good 3rd page position for the main kw, and 1st page presence for many long tails. The images in the article were always ranked top 10, for any of the related terms. That until yesterday. The blog lost many rankings, and the pictures are nowhere to be found. The intriguing thing is this: The blog is 100% “natural”. I did no kw optimization, no link building, no submissions to directories and whatnot. Nothing. Ever. I just wanted to see how far can “natural” go. It has never been monetized. I don’t have anything monetized. I got linked naturally by other bloggers that found my articles, I got few links in forums by other people linking my content. Two weeks ago, a lifestyle blog linked to my latest article and pinned an image from it. It got 145 likes, 465 re-pins and 1 comment till today and still growing. At first I thought this was the cause of losing the good rankings I had for so long (each re-pin has its own URL). I lost rankings the same day (March 6th) when WMT updated my total links number from 30 to 80, due to this latest Pinterest buzz I got. But I do suspect it’s more than that. I didn’t “actually” lose anything, but this will be interesting to follow nevertheless. Yep, I checked on forums (warrior, trafficplanet etc.) people noticing a change everywhere. There was definitely an update yet nobody knows for sure what it was about. Spencer, great progress so far! Thanks for your updates and hard work. It’s really appreciated. Would you mind sharing what you’re using to find out where you come in on Google in the early days of a site? He is using long tail pro/platinum’s rank checker tool! I have a question about choosing a niche. Let’s say my keyword research has returned some good kw’s. One keyword is “Nike duffle bags” another is “Nike knit caps” and another is “Nike clearance sale”. With these theoretically returning good analytics and each being words I think I could rank for, would I create one domain name that would not be an EMD, ex. NikeGear.com and then try to rank for those three kw’s within my niche sites content pages or would I buy three different domains (which I can get EMD’s for) and make micro-niche sites for each of the three somewhat related products? Are there benefits to combining related products that each have potential on their own or does this dilute my chances of ranking for a specific kw if it is deeper in my site? I kinda gave up on niche sites after panda crushed most of my niche sites a while back. but now after finding this site and reading how you are still making it work well, I think i may have a re-newed interest. You blogs have given me some great new ideas. Hey there Spencer. I have another question after going through your new site again. If you’ve handled this question already, please forgive me but i haven’t run across it. I notice that some of your Amazon links are to products sold by Amazon themselves. Others are to sellers other than Amazon. Did this weigh into your choice in choosing which knife to list? My initial thinking was that some of these third-party sellers could one day decide not to carry a knife that’s included in your list. Yes, Amazon could do the same but my thinking is that they’d be much less likely to do so. Just wondering what your thoughts are on this? Let me clarify. The “other” people I refer to are Amazon sellers – but not actually Amazon. Just wanted to say thanks for sharing this process. I’ve been inspired and I used it to build my own page in a similar fashion. However, instead of making it an independent niche site, I’m trying to make it a piece of what I hope to eventually be a larger authority site. As you can see, I used a similar approach to the knife site, except I’m pulling my pricing directly from Amazon via their API. This is great, except for two things. Firstly, some of the prices occasionally don’t load. I don’t know if I’m making too many calls to Amazon at once, or what. Secondly, if the manufacturer doesn’t allow you to see the price until you add-to-cart, then it will instead show “Too low to display”. Really don’t like that, but I guess it is what it is. Anyway, I’m using a plugin called “Amazon Link” to help me with pulling data via the API. There’s a learning curve as it’s not terribly well-documented, but it’s quite handy once you start to understand it. I set up a template for “price” once, and then I can just add shortcode to add the price to my tables. Figured I’d share what I’ve been learning so far. Thanks for sharing David! Great to hear there is a plugin for this. Yep…now I just need to figure out if I can cache the prices or something to ensure that they always show up (and if that’s allowed by Amazon in the first place)! using my longtailpro i see the site dropped to 210 on google. Something happened to make it drop from a top 30 rating…wondering if Spencer could help us newbies along when something like this occurs and how to go about correcting it? thanks for your time and valued info! just read your new article on what happened with the Google penalty incident. I am amazed that not only you were able to identify what caused the ranking drop but were able to correct the offending links and regain the site ranking….just checked and you back all the way to 23rd!! man.. I was having so much fun slacking off.. darn your article for making me realize I need to get back to work on my site. I currently only have one solid article on my site. But I will be checking out your site some more, and writing some more soon. Also maybe a fancy spread sheet like yours. I choose the keyword by long tail pro, and keep step to step as spancer said, i am waiting the good news comint to me. But it is a very hard work to build link, maybe i am a beginer. I may have missed this, but what site did you use to hire the person to design your header & logo? I had already ourchase your Niche Site Theme before I began following you and am using it for one of my niche site snow. But while the site theme is good, the one thing it lacks is customixzation of the header. And that’s why i asked my question. I tried crating a heade vis MS Paint with disasteroous results and realze I need a pro to do it. SO, can you share how much it cost you? I used my own graphics guy that I’ve used for a couple of years. I think I originally found him on freelancer.com. It was around $50. Really enjoying the blog. Quick question, would you recommend paying for web directory submission through a designated site or to enter them in manually? If it is a manual task do you have a list of the best ones to go for – you mention around 50 you get your VA to complete? Best of luck with the site. You can do either. However, if you do them manually, you are likely to get better submissions with a higher approval rate. How are you tracking your ranking? Is there a way to see what keywords your site is ranking for that you may not have planned? I just created a new site 7 days ago today and have 6 posts so far. I did check and the site is indexed, but used Rank Checker Plugin and it doesn’t rank for my primary keyword. I think this plugin only shows top 100. Scott, I’m using Long Tail Pro to keep track of my rankings. You can see Google Analytics which will show traffic from keywords you were not planning. Then you can track those new keywords. It may take a few weeks before your site really shows up anywhere, that’s normal. I own Longtail Pro and haven’t been using the rankings inside. I was getting a notice from Google that I was sending a lot of traffic to my IP address. It had me type a captcha code and it resets. But, that kinda scared me. How often do you check rankings? I check my rankings every couple of days or so. (Just for this site though because its public). again, what software is best to automate the web directory links for web 2.0 and to make all the web 2.0 accounts and the blog comments? i have 35 sites to do fast. scrapebox? ultimate demon? thanks. 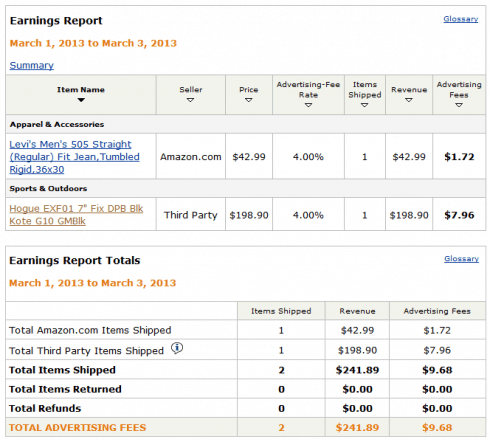 amazon carousels are suppose to convert 3 to 1 over image links or text links. also you should interview blackhat forums amazon experts like ellen for your site? seospyglass free verision has given me a copy of your directory list but cant scrapebox do this the fasteest or what software? i cant afford va at this point. thanks. I know this is probably a really basic and newbie questions. What is the best way to tell if you site has been indexed and google and what the position of the site is for the keyword. Type in Google: site:yoursitename.com . If nothing pulls up, you are NOT indexed. Wouldn’t be easy using amazon plugin , please explain this , because you said you spent 6 hours on the tables you made on your niche site . Very thanks for your update info. Actually I’m following your tips to build my first nieche website. The result is very nice for 1 month age site because there is 1 order from Amazon 🙂 Thank you !! Directory Links really does good results. Just wondering, regarding the submissions to the link directories… Ususally you need to write some keywords, a description etc when you submit the link. Do you tell your VA to submit axactly the same description everywhere, or is it important to vary it? Is google more likely to consider it as spam if you use the same description over and over again? What do you think? Great start I’m excited to follow you for years to come. I need to get the link building going. I found this series a few weeks ago, and I just want to say that these articles have been very motivating! I’m currently in the process of reviving a niche I started last year and, while I’m writing all the content myself and not outsourcing, it has been really refreshing to get the site ranking again. Last year, I managed to rank #1 for my primary keyword and on the first page for many of my secondary keywords. However, even while I was getting 600+ unique visitors per day, the site wasn’t making money (literally pennies every month). Then the site went down for several months (since I couldn’t keep up with hosting fees). I managed to get the site back up again several months ago and have been filling it with fresh content since then (mainly trying to get the site ranking on page 1 again – so far I’m ranking on page 2 for my primary keyword). I’ve also been trying to increase my Amazon conversion rates – and for the first time since the site started, I noticed sales have really picked up on Amazon. Though my niche-related products aren’t anywhere as expensive as your product referrals (so affiliate income is a tad lower). While I don’t expect to make over $500 per month with this site (unless I wrote a ton of content or managed to increase traffic/conversion rates phenomenally), I still have high hopes that I can at least reach the $100 mark if I really push myself. I just wanted to thank you for writing this guide. The comprehensive knife chart was really a neat idea – I can definitely see myself doing something similar with my niche. For someone who has a really bad habit of starting things but never finishing them, you’ve given me the motivation to keep on going. Hi. I was under the impression that you needed to really display the fact that you were using affiliate links very prominently because of new rules from the FTC? I don’t see that on your website anywhere, especially on the table on the homepage… so what exactly is the rule of thumb? Okay works for me. Just found your site yesterday and really enjoying it! Thanks! I am a newbie to this and was wondering: How do you check your page ranking on google? Quick question about the Web Directories- did you just look for a list of high PR free directories, find a web page that had a list, and send that to a VA to have them submit your site to? Or did they do all the legwork to find the directories and submit? I’m a little afraid to have others submit for me with the risk of penalties. But I guess as long as you mix up the directories you submit to, so that they’re not all high PR, it probably won’t matter. Yes, I found the list myself and had them submit. I don’t really recommend using directories much anymore. I haven’t done it for my past few niche sites. I’m just looking for something to help my rankings. I’ve created several web 2.0 sites with articles linking back to my niche site, submitted to hundreds of article directories using Unique Article Wizard pointing to those web 2.0 properties (all suggested by Pat Flynn), and have posted blog comments and forum posts on relevant sites. Yet I’ve seen no real improvement in ranking for my keywords for almost a month now. Just figured some directory submissions might help. I want to keep writing articles but before I spend much more time on the writing (I currently have 13 articles, not counting the homepage written) I want to be sure that I can get the ranking part of it down. It’s the one part of this that has been the most difficult. I don’t know what I’m doing wrong. I think you may be reading some of Pay Flynn’s older material (from Niche Site Duel 1? )…hundreds of article directories and UAW is pretty outdated; I wouldn’t recommend. Link building changes every six months or more. So, you always have to make sure what you are reading is fresh.